"This delicious soup was a favorite of mine while attending college. My family has been enjoying it ever since! Very easy and quick to make. 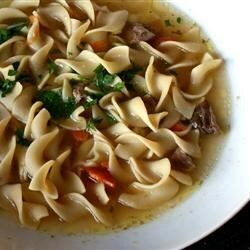 It includes stew meat, mixed vegetables and egg noodles in a beef broth base." In a large saucepan over medium high heat, saute the stew meat, onion and celery for 5 minutes, or until meat is browned on all sides. Stir in the bouillon, parsley, ground black pepper, carrots, water and egg noodles. Bring to a boil, reduce heat to low and simmer for 30 minutes. Chef John makes pho, the spicy Vietnamese noodle soup.